This large 8 3/4" alphabet plate has a crisp image transfer printed in rich dark bittersweet chocolate brown with great color polychrome hand painting in cinnamon brown and green. The image is part of the Wild Animals series coveted by collectors. This transfer, rarely seen on the market, will be a special abc plate in your collection. 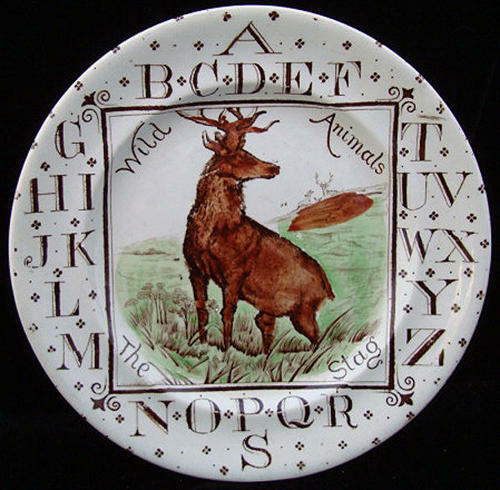 In addition to the entire ABC alphabet transfer with the classic Brownhills decorative transfer, this plate has a central cartouche of a Stag in the butte' area of a mountain landscape looking over his shoulder at his herd. Outstanding. Condition is great. Clean shiny and bright with no cracks, no hairlines and no repairs. You won't find a better example.